Tiny islanders the Lorbs mistake Pascal for their mystical ruler; the chameleon loves the adulation, until he's expected to protect his people from a vicious monster. s02e18 - You're Kidding Me! 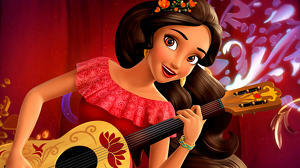 Set between "Tangled" and "Tangled Ever After", this animated adventure/comedy series unfolds as Rapunzel acquaints herself with her parents, her kingdom and the people of Corona.